With the exception of maybe ravioli, Abby’s never met a stuffed, wrapped, bundled food she didn’t love. Shumai, quesadillas (aka “Triangles”) fish en Papillote (aka fish presents)…they all have an ERC (Expected Rate of Consumption) in the high 90th percentile. 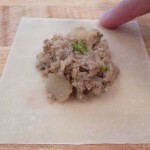 It was no different with these little pork dumplings, which I debuted at the family table last week. See that photo above? There were seven piled on the plate, but the girls kept grabbing them before I was done taking the picture. It was too hard for them to wait. I would classify this recipe in the Project category. There are lots of things little kids can do — fold, pinch, and “paint,” — to help move along the sometimes tedious work of assembling them. Goes without saying that you should probably not undertake this kind of “project” on a weeknight when the bedtime clock is ticking. Better for a weekend or vacation day. 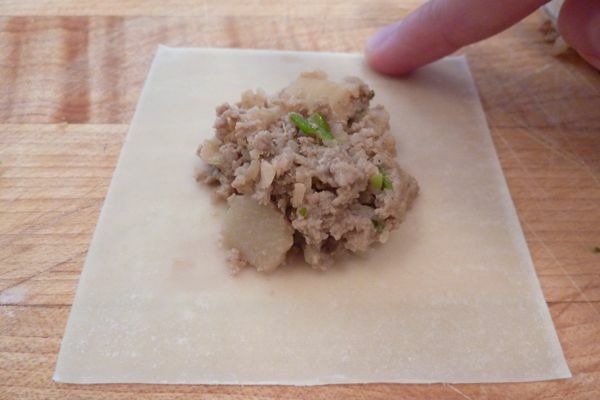 How to assemble dumplings: 1) You only need a small bit of pork filling. 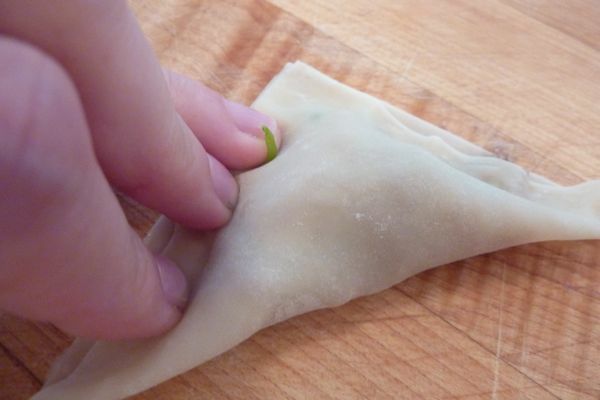 Dip your fingers in water and dot or “paint” the edges of the wonton. 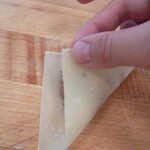 2) Fold one corner over the opposite corner to make a triangle shape. 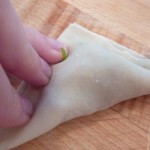 3) Pinch all sides together. Takes about 1 hour start to finish; Makes about 3 dozen. 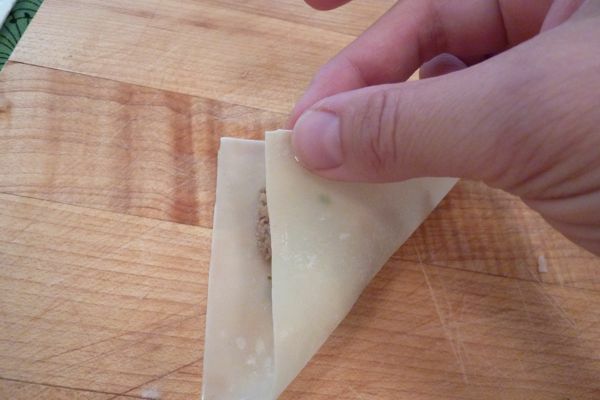 If you are so inclined, you can skip the grating and the mincing and chuck all the filling ingredients (not the wonton wrappers or canola oil) into the food processor and pulse until combined. If you do it this way, no need to cook the pork first. Cook the whole mixture in a saute pan over medium heat after it’s been processed. Add the oils to a large frying pan over medium heat and cook the scallions and ginger for about one minute. Add pork, breaking it up with your spoon in pan, and raise heat to medium-high. Once the pink of the pork is almost gone, add 5-spice, soy sauce, water chestnuts, and cilantro. Let cook another 2 minutes and take off heat. Transfer filling to a bowl. Set up your dumpling station: A bowl of water, the filling, and your wonton noodles. Assemble as directed in photos above. Add canola oil to a large skillet. Fry in batches over medium-high heat until crispy and golden, about 2 minutes a side. Serve with dipping sauce and snowpeas. Dipping sauce note: Instead of making my own (which I imagine would be some combination of soy sauce, scallions, rice wine vinegar) I just used that Fairy Dust, I mean Soyaki sauce from Trader Joe’s. It’s only 8:48 AM and already these look so delicious it’s scary! I LOVE dumplings! 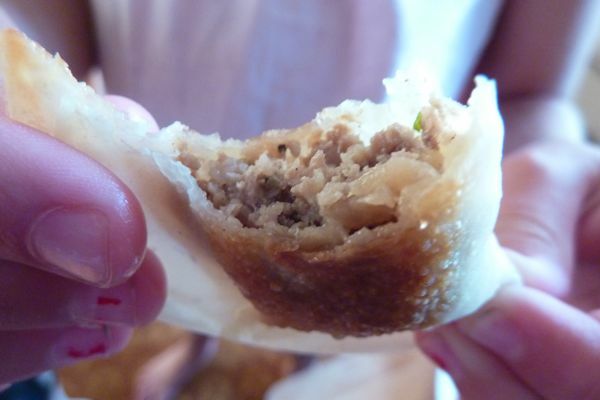 Smart girlies, dumplings are the best! I too love all things wrapped and stuffed. Then again, my fave cereal is Coco Pops. How adult of me. sounds yummy. it would as good with phyllo dough as well. You did a great job with these dumplings. Look yummy! What would you think of a fruity variation? Filled with something sweeeet for breakfast or so? These were delicious! Thank you for the recipe, my son (4 yo) and I prepared them, although he bailed on me at the stuffing part. He declared them great! Thanks again! These look yummy and cute. 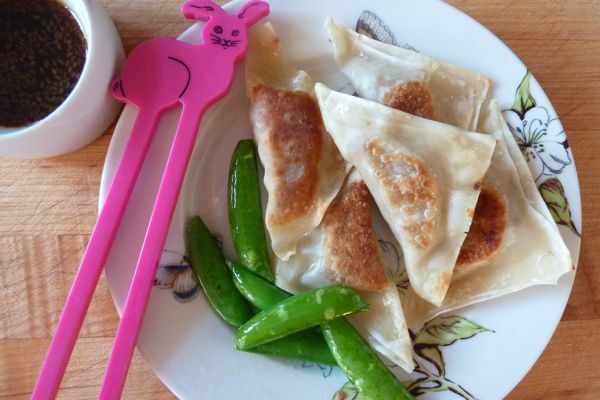 A great way for beginners to make Asian food and there’s nothing like little parcels to get the kids interested. Of course, it’s nice to have help with assembly too! I like your parallel with crafts – maybe kids might be more interested in getting involved in the kitchen if more parents can take advantage of this similarity? Cooking with the family allows time for bonding and for kids to be involved in food preparation and food choices. This is especially important when it comes to learning life skills and how to eat healthily. Research has shown that kids that eat with their families do better in school, are healthier and have better communication skills. That’s why I work with the group behind the Healthy Monday campaigns, which are behind a series of public health initiatives. We just launched a new campaign, The Kids Cook Monday. The Kids Cook Monday presents families with a weekly opportunity to take health into their own hands. More info here: http://www.healthymonday.org/the-kids-cook-monday/. We’re looking for family-oriented blogs to do The Kids Cook Monday posts every Monday on their blog to help spread the word. If you’re interested in weekly posts please email me at mondaycampaigns@gmail.com.